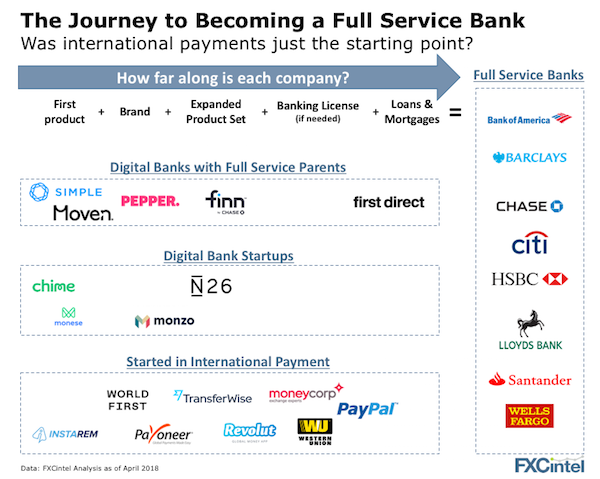 Is International Payments the Stepping Stone to Becoming a Bank? Do all roads lead to full service banking? It’s no secret that many of the international payments startups are seeking to take customers from banks. Banks have upped the ante by creating better digital platforms and accounts for their tech savvy customers – some have even made the jump to creating entirely different products and accounts to attract these customers, such as Santander’s new One Pay FX app. But as international payment companies evolve to attract more customers, they get closer and closer to the entities they are challenging – the big banks. What makes a successful bank? Obviously, you need products and a banking license – but is that everything? Where do we draw the line between big bank and international payments company or digital current account (ie mobile wallet)? The product that really differentiates the companies above is loans and mortgages. It is the heart of what full service banks do and also the last leg of the journey for those wanting to become banks above. The skillsets needed for lending are very different to those of transactional banking. But in the end, a loan is the stickiest product a bank can have. Want to know where you stand versus the competition? We track all of this in our FXC Intelligence portal. Is the race on…to IPO? They started from very different places but are the goals now the same? Are the biggest competitors to the best funded payment companies now digital banks? Launching the products, getting licensed – these both take time but are not giant barriers. Building a trusted brand to go alongside those products is the difference maker. The brands on the right of the graphic are literally household names. Apart from Western Union and PayPal, none of the brands on the left side have this type of recognition, although several are getting closer. Is a public listing the answer? It is no surprise the companies with the most well known and trusted brands are those that are publicly listed. PayPal, Western Union and the full service banks are the only publicly listed companies above. Across the entire international payment sector, there are only a handful of players with stock market listings (they were previously analysed here). That begs the question – will a public listing be needed to gain that next level of financing, trust and transparency to complete the journey for everyone else?